 A three-scoop helping of Holmesiana ranging from reprints of classic parodies by Bret Harte and O. Henry to evergreen pastiches by Vincent Starrett, August Derleth, and Stuart Palmer to new stories by Jon Koons, Roberta Rogow, and Carole BuggÇ (whose ``Adventure of the Tongue-Tied Tenor'' is a particular standout). 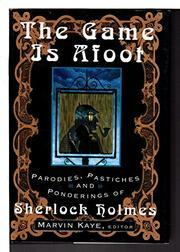 The emphasis is on fictional items--Holmes is sent to Oz (Ruth Berman) and Damon Runyon's New York (Craig Shaw Gardner), pitted against the Nazis (Manly Wade Wellman) and a doppelgÑnger (Darrell Schweitzer), set to solve the mysteries of Edwin Drood (Edmund Pearson) and Little Red Riding-Hood (Anthony Boucher). But there are also some ten essayistic pieces contemplating Holmes's parentage (Jacques Barzun), his disguises (editor Kaye), and his adventures in Tibet (Amanda Russell), and offering testimony by Mrs. Hudson (ZaSu Pitts), Professor Moriarty (Robert Bloch), and Holmes himself (Maurice Baring). Of the 53 selections, all but a dozen reprinted--though many of the reprints are not easily available elsewhere--the stories are clearly superior to the essays, though the line between the two isn't always easy to draw. Veteran anthologist Kaye (Masterpieces of Terror and the Supernatural--not reviewed--etc.) aims for inclusiveness, right down to his useful Holmesiography, and the only glaring omission is Rex Stout's Baker Street burlesque ``Watson Was a Woman.'' Devotees will be too grateful to complain about its absence, or about the inevitable unevenness of the assembled works--nor will they be foolish enough to devour this sumptuous feast in a single sitting.